Combine all ingredients in pressure cooker. Bring up to pressure and cook for 40 minutes. Release pressure and check to make sure they are soft. If not, bring back up to pressure and cook another 10 minutes. Place Brownie Mix, flour, and mocha beans in a mixing bowl. Mix to incorporate. Add vanilla, coffee flavor, water, and warmed shortening, and mix until evenly dispersed, being careful not to over mix. Pour batter into an oiled and floured or non-stick baking pan. Bake for approximately 20 minutes, or until the center springs back when gently pressed. Cool. Place tofu and sugar in blender. Blend until smooth and creamy. Add the melted chocolate chips, vanilla, and coffee flavor. Blend until smooth and creamy, scraping down the sides. Start with cooked and cooled brownie as base. Spread remaining Mocha Black Beans evenly on top of brownie. Spread Mocha Cheese Cake Filling evenly on beans. Refrigerate until set. Mix Garbanzo water and Amaretto together. Mix powdered sugar, soy protein powder, and vegan aspic together until evenly dispersed. Add the dry mixture to wet mixture and whip until light and smooth. 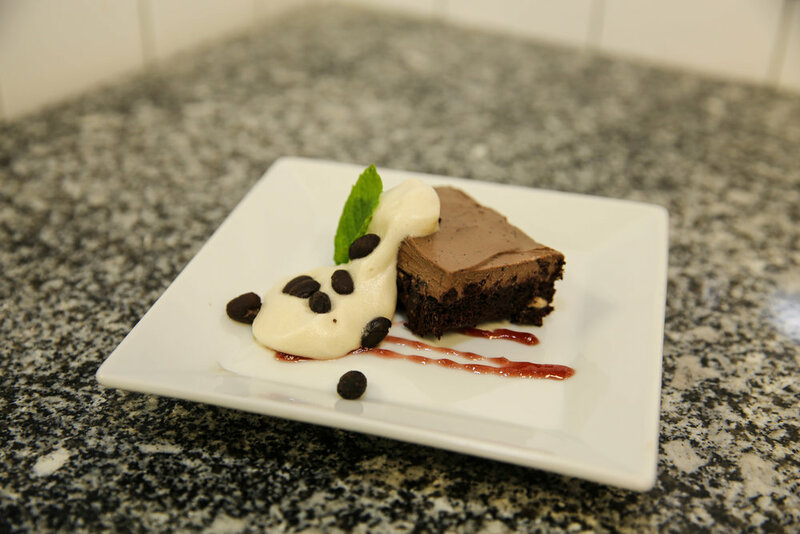 Serve on top of Mocha Black Bean Brownie Cheesecake. Note: This mixture can be refrigerated and re-whipped when ready to serve. It will lose its light texture when sitting for prolonged periods of time.